If you’ve never experienced one of Méliès’s masterful early-20th-century fantasies, you couldn’t do better than to start with this interpretation of countryman Jules Verne. 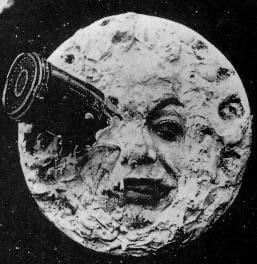 Images from it (especially the bullet-like rocket implanted in the eye of the man in the moon) are iconic images of early film, and are sometimes unfairly used to suggest the scientific ignorance of people from the period. Watching the film makes it very clear that it was never intended to be serious. Much of the movie is taken up with the astronauts fighting moon men who burst like balloons at the slightest touch. At fourteen minutes, it’s an easy view for modern tastes, even those not comfortable with silent film.